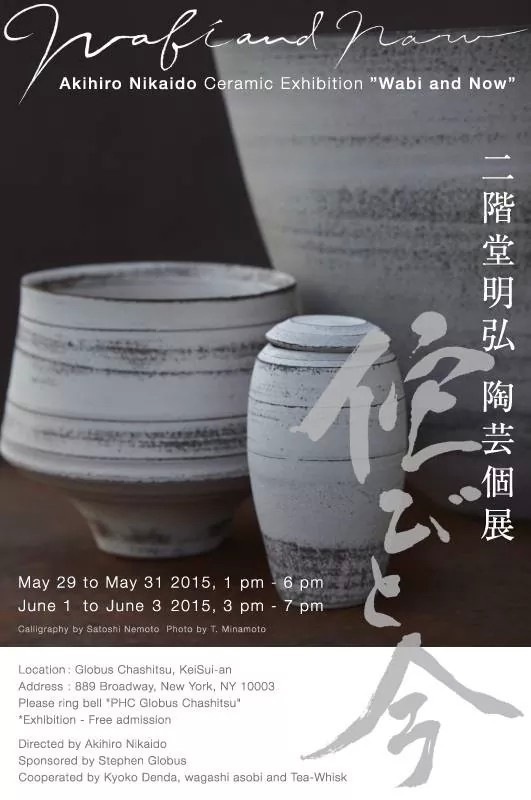 Akihiro Nikaido Ceramic Exhibition "Wabi and Now"
Friday, May 29 through Sunday, May 31 from 1:00 p.m. until 6:00 p.m.
Monday, June 1 through Wednesday, June 3 from 3:00 p.m. until 7:00 p.m.
Globus Chashitsu KeiSui-an, a teahouse located near Union Square, hosts Akihiro Nikaido’s ceramic exhibit and a creative collaboration with artists exploring the theme of “Wabi and Now.” Ceramic artist Akihiro Nikaido in Mashiko, Japan; tea ceremony masters Souheki Mori of Tea-Whisk in New York and Kyoko Denda of Lempicka in Tokyo; Japanese confectioner Motohiro Inaba of wagashi asobi; and calligrapher Satoshi Nemoto offer guests a reflective exhibition of ceramic, sweets, calligraphy, and the ingenuity of the tea ceremony. Saturday, May 30 2:00 p.m. until 3:00 p.m. Guests will enjoy two tea masters from different Japanese tea ceremony schools serving the matcha at once. Usually a tea ceremony is served by one tea master, so it is a rare opportunity to observe the differences and the similarities of their respective schools. Includes a ceramic talk by Akihiro Nikaido and handmade sweets by Motohiro Inaba. Saturday, May 30 from 7:00 p.m. until 9:30 p.m.
First guests will enjoy full Japanese food by chef Fujiko Aoki, a food producer for wisteria catering and mochi Rin in New York, and handmade sweets by Motohiro Inaba. Then the group will move to the tatami mat space to enjoy a candlelight tea ceremony conducted by two tea masters from different tea school serving the matcha. Akihiro Nikaido will explain his works during the tea ceremony. Sunday, May 31 from 1:00 p.m until 2:30 p.m. & 3:30 p.m. until 5:00 p.m.
Japanese tea ceremony master Kyoko Denda will serve tea, and then guests will make their own tea by whisking a bamboo whisk. Motohiro Inaba will provide handmade sweets. Sunday, May 31 from 5:30 p.m. until 6:30 p.m.
Japanese calligrapher Satoshi Nemoto will lecture on “Beauty of Japan, the World of Kana Character” followed by a live calligraphy performance. Sweets and matcha included. Monday, June 1 from 4:00 p.m. until 5:00 p.m.
Tuesday, June 2 from 4:00 p.m. until 5:00 p.m.
Japanese confectionery chef Motohiro Inaba, formerly of Toraya in New York, has returned for this special event to teach guests how to create sweets. For these special events, reservations are required as seating is limited. RSVP at info@tea-whisk.com with your name and desired date and time. Next Next post: It’s Our Birthday!